Delhi woke up to a blanket of dense haze which affected vehicular movement on the roads and left school-goers gasping for breath. NEW DELHI: The world of Twitter today erupted with emotions -- ranging from displeasure and concern to despair and humour -- as a thick smog shrouded the national capital, raising health and environmental worries. As pollution levels breached permissible standards by multiple times, a spate of tweets followed. "DELHI BE LIKE: #smog filter for today because Instagram filters are too mainstream!" one @BarneyStinsonYo tweeted. In a lighter vein, many Twitter users referred to Diwali, when the bursting of crackers was banned as a move against pollution. "Thick #Smog In Delhi. This Must Have Been Caused By People Celebrating Diwali By Bursting Crackers Last Night. Shame. Ban Diwali," user @SirJadeja wrote on the micro- blogging site where #DelhiSmog has been trending since the morning. User @prassenjit was sombre in his response, saying, "#Delhi NCR clouded in #smog #today. The #pollution levels are alarming and need immediate policy making and execution #ClimateChange #India." Many famous landmarks, including the Connaught Place market and several towering buildings, virtually disappeared in the haze, as people took to Twitter to post pictures of the areas as seen from rooftops or windows of high-rises. "Can barely see the tallest buildings in the neighbourhood. #DelhiSmog," said @indiancounsel. The thick envelope led to disturbance in vehicular movement and affected air travel too. "Sitting on tarmac as Delhi smog delays flights 2 the city. Gone r the days when such delays were reserved for early mornings #delhismog," wrote one @Tinkuray. Another tweet referred to the smog that lingered till well after noon. 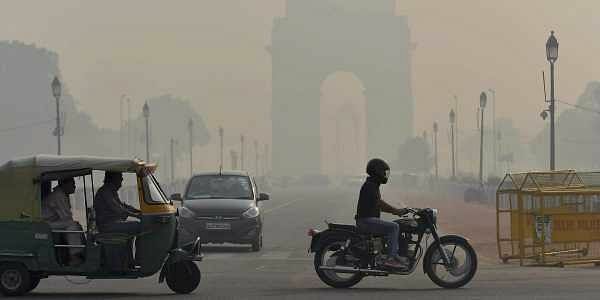 "Delhi is most polluted city in world for a reason. It's 12pm and still #smog all around," tweeted @GAUTAMGUPTA10. But, among all emotions on Twitter, humour perhaps was the most noticeable. "Advisory to Delhiites!! They can buy packets of Lays and breathe fresh air from it!! #DelhiSmog," wrote @dekhane_mukul.